It was nice to see the NYSB Weather Page get some use this year. Much of what is there came from suggestions from readers. We'd like feedback on it. If you have ideas about how to improve the page - links, maps, whatever - post them here. Thanks. Weather Page is now updated to include winter maps: snowfall (regional and northeast) plus storm tracks. While I think they are cool, they seem to be updated hours after snow has fallen, like the next day. 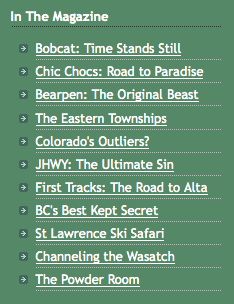 In the past, when the season got going, we put our list of webcams and the mountain conditions reports on the NYSB homepage. 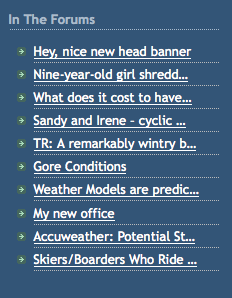 I'm thinking of keeping those spots as they are (on the homepage) and put Web Cams and Ski Reports on the Weather Page. While that spot isn't as prominent, it's kinda where all the decision making data is kept. Do you use webcams and ski reports? Will you use them there? Input welcome. The other is a static view that doesn't always get updated. Odd...the Gore webcams are missing. Yeah, Harv, did you forget the link er something? Harv, Think you can get WF to try placing web cams on the mountain that actually show some of the terrain instead of the mid lodge picnic tables? At least they could reposition it so you could see up Mountain Run and Wildy. Need another at the top of Little WF looking up toward the summit also. Guess that would be a little to much to ask though.